We have heard your feedback regarding the imbalance of Player vs Player (PVP) combat and want to share some information about the upcoming Player vs Player (PVP) rebalance and bug fixes. These changes are slates for the 8.26 release, which is expected the week of June 26th. Instead of having an additive bonus of 25% for each turret, we have discovered a bug in which the group bonus of Tier 7 turrets is being calculated multiplicatively. This is causing a wider than intended swing in the power of base defense by granting a 600% bonus to a full set of turrets, rather than the intended 200%. In the 8.26 update we are correcting this calculation to be additive, to match the description of turrets. This will give a total of 200% bonus with a full set of 8 turrets. While we do not have a problem with powerful base designs, the intention was never to be able to create an unbeatable base. The team has recently discovered a bug in which any weapons or counter measures equipped to a ship have an unintended 100% bonus to accuracy. This has made counter measures that are equipped to defender hulls much more effective than intended. This bug is being corrected in 8.26, the week of June 26th. And will the deflections on the hulls will come down as well? Because heavily nerfing defense while doing nothing to the attacker will ensure the turrets do nothing. Do You realize that you just made every turret useless.. You just made the problem worse. If this goes through you will get even more players to quit.. Do you even have any clue about the damage needed to kill a fleet? Does any Kixeye employee actually play the game? Im sorry to say but this is just plain retarded. This will probably flagged but it doesnt mean that what i said isnt true. kix you all are out to lunch. this was released in march 25... and has been pretty much spot on. so ya. this was known for a long while. with that said, are they going to also re do the calculations for fire support stacking?? Congratulations on addressing an issue you were informed of over 2 months ago. Now as someone who was involved in player driven testing of the turret damage it is quite easy for me to see the reduction in damage that will be caused with this change. However where as before an executioner turret built for maximum damage with 8 T7 turrets in the group would put out damage as follows. 374766/2*1.35*1.31*1.25*1.5*1.15^5*1.25^8/2 = 3724567.36 damage to the hull after 50% turret defence. A difficult number to balance and rightly needing to be reduced. 374766/2*1.35*1.31*1.25*1.5*1.15^5*3/2 = 1874636.13 damage applied to a hull after turret defence. What this means is you are in effect negating missile turrets against missile cruisers even before additional armour has been equipped. The same can be said of ballistic turrets against the impact cruiser without me needing to bore you with the math. All one needs when designing an attacking fleet is add armour to counter the opposite faction to either of these hulls and one need never worry about a turret when attacking a base ever again. I urge you to please consider that adopting this step without implementing change in the armours you've since released will only result in a massive swing in the opposite direction making turret designs irrelevant to base defence. I think you've done untold damage to the pvp community without further aggravating the situation. If you wish to any further advice on how to do so please feel free to contact me. I should also add i look forwards to being able to participate in the aspects of the game I enjoy in 20 days time. Until then I feel it's only right to curtail my participation. You mean the "bug" that [Insert name here] has been speaking about for the past 3-4 weeks or longer ? But thanks to the BP team for trying to sort this mess out. I for one, appreciate any effort put forth in an attempt to try and keep this game on track, which I'm sure is not an easy job. Yeah...I admit that sometimes I, as well as some others, get a "bit" carried away with our rants about the way things are going within the game. And sometimes the anger gets misdirected, but that's because we ALL have passion for the game. Or...we did anyway. So, I apologize for anything I have said that has offended anyone personally. But just don't expect me to sit quietly in my corner with my coloring book and box of crayons. 374766/2*1.35*1.31*1.25*1.5*1.15^5*2/2 = 1249757.42 damage applied to a hull after turret defence. Every turret this year they will make garbage if this is what they do... They have no clue on how to fix it but this is not how. 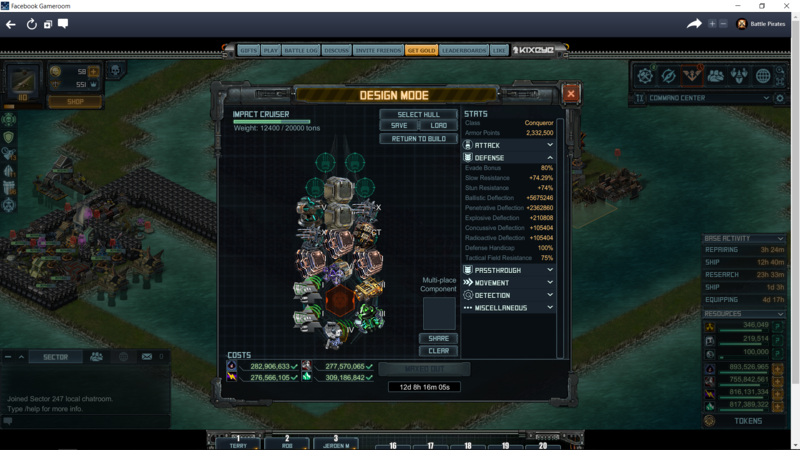 If i have all 8 missle turrets i should be doing some damage to ICs and ONS. With this change I wont be doing any. Even howies will be reduced to nothing when they should be doing damage to MSCs and ONS. It shouldnt have taken weeks to come up with an idoitic plan like this. If this goes through their will be more boycotts but this time it wont be just SDS7 itll be the whole game. KIXEYE will lose players and more and more profit. Dont do this. Actually run numbers and see what the best options are. Swing time.. do see do.. time to be a farm again. Will that be in time for the next bounty? will most likely be right before bounty week..
Nerf one single turret and it will be my last day. What you are doing is illegal. You cannot continue to sell people a BMW and then take it back and say here is your Pinto. So what this means, is that the already super power fleets a number of people have will be even more powerful because Kixeye will reduce my defensive capabilities that I worked hard to build. Does that seem to favor the big players, or is it just my imagination? Back and forth, back and forth... This is getting to be really freaking annoying FIND A **** BALANCE AND GO WITH IT. WTF! Two months to acknowledge, and three weeks to fix. And as Spack said above, this is by far not a solution. Unbelievable, by far not suprised. 1. Faction bonus. Yeah, it's only 20%, but when bonuses are compounding like they do, it adds more than it sounds like it would. 2. Your second calculation only factors in a 100% turret group bonus. The actual bonus of 200% in reality makes the final damage 1874636.13 if excluding the Faction bonus. You, as well as a number of others in this thread, also fail to take into account that only two damage types for turrets have been released so far. By focusing only on "now", there's absolutely no notion of what the bigger picture may be. For instance: As more damage types are covered, and we all know there will be, it'll be harder and harder for attackers to cover all turret compositions. While it may be painful in the short term to swing the pendulum back to attackers, I see that as being more recoverable than the current situation. And, toward the end of the T7 era, could make for an interesting Attacker/Defender puzzle. Personally, I would have liked to see a full suite of damage types released, then a new set that escalated on those while pairing armor upgrades, etc. But that's just me. This is wrong to just change the turrets and not change new armors also. It will swing to attacker 100%. I know several who coined those turrets and do not have max capacity. So you will succeed in killing game after all. you put out chores with no hull available now you remove base defense. Yes I know some bases could insta kill fleets, but it wasn't a huge % of bases that could. Now no matter if your base could or couldn't insta death fleets, they will now no longer be able to do much, if any, damage to the incoming fleet. So much for those that enjoy base defense. Hopefully kix can come up with some middle ground fix instead of swinging from one end of the spectrum to the other. Although five years of playing has shown me it's not likely kix knows how to do a middle ground fix. Oh well, in a month or so kix will swing it back to base defense. I have paid to build a base to stop the current conqueror fleets and now I hear you are going to nerf the turrets.. I built this base to balance out what was in the game at the time if your going to nerf the turrets I would like to be reimbursed for what I spent to get this base to where it is. Nowhere is it legal to take something sold and change it after the fact because you guys didnt do your homework. Have you noticed all the abandoned bases? .. can you figure why? nerf my turrets and I will join the abandoned but I will try to get reimbursed for what was done here .. The faction bonus was deliberately omitted as the only area where it will be relevant were if the two new ballistic were added. Then the effect would be only impact cruisers are relevant in the course of base hitting. That would again present another problem in the swing mechanics. As for the mathematical error in calculation that was immediately corrected some time before you posted but my point still stands. Making the game so the only viable hull for base attacking is the one just released and it itself takes zero damage from turrets is not a good way to provide balance and sustainability to the pvp environment. Shh. Guard fleets will do a whole bunch of jack **** as well.